Today I decided to jump back to one of the Cognacs given to me after my appearance on the Camus Cognac ByTheGlassShow.com episode. 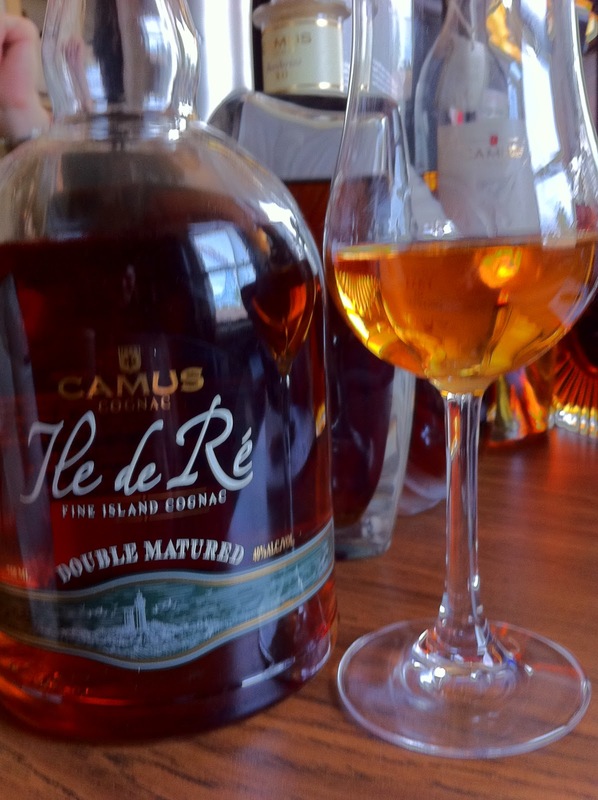 Camus' Alexandra Albu provided me with an additional sample of the Ile de Ré Double Matured Fine Island Cognac that we had tried on the show. "Double Matured" is their middle-of-the-line Cognac that comes from the grapes they grow on the Ile de Ré island, the most western part of Cognac. Double Matured is given its name based on the dual aging process used to produce the final product. The Cognac is first aged on Ile de Ré in damp and humid cellars. A second aging process takes place in lightly charred and toasted barrels to provide the final Cognac with some smoky characteristics. Great violet and dried orange peel aroma. Some honey and a little wood are also noticeable. Very enjoyable bouquet. Sweet but also salty right from the beginning. Definitely noticeably briny. Some really nice fruit and orange flavors pop first. Dry wood flavors are also prevalent. And there is an underlying spiciness that is enhanced by the alcohol heat. Everything I've read including literature direct from Camus and even my own review from the show talks about a "smoky finish". Don't get me wrong, I can taste the toasted wood characteristics, but the smoke is faint at best for me. Perhaps I just need a bigger sample (hint: Alex). The finish is dry and you are left with some heat in the chest and throat. Has some whiskey and Scotch characteristics and flavors. I bet they will be able to steal a few of those drinkers. 80 proof. Approximately $65-$70 for a 750 mL bottle. Could this be the spirit to make you switch? Find out for yourself.